The second 'Casca' novel finds the Eternal Warrior slipping out of the Roman Empire into the Barbarian lands, then north to the realm of the Vikings. Ultimately becoming a leader, he and his men sail across the Atlantic. Casca thus discovers America, but the book barely touches on this before the warriors continue south to what is now Mexico, where they become involved with the people there at the time of the Olmec civilization. I thought this was a very solid book, but it was lacking a certain something. Maybe I’m just too Eurocentric to get a charge out of ancient Mexico (and two-thirds of the book is spent there), but there was also a lull of fifty pages or so in which Casca gets accustomed to his new home and nothing much happens until the climactic battle that closes out the story. 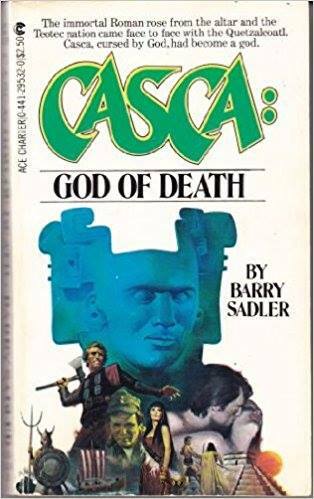 In any case, second-tier Casca is still better than the average action-adventure novel, and this will be worth reading again, but it would have benefited from some tighter editing.